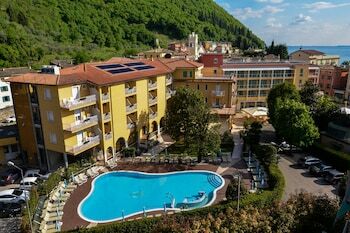 A stay at Hotel Bisesti places you in the heart of Garda, a 4-minute drive from Al Corno Beach and 6 minutes from Baia delle Sirene Park. Featured amenities include a 24-hour front desk, multilingual staff, and luggage storage. Planning an event in Garda? This hotel has facilities measuring 2153 square feet (200 square meters), including conference space. Free self parking is available onsite. When you stay at Fattoria di Bacchereto - Guest House in Carmignano, you'll be 14 minutes by car from Church of San Michele. Free self parking is available onsite.